A week after we moved here, my downstairs neighbor showed up with an armload of board games. My kids were ecstatic because apparently I’m allergic to board games so we have none. Today when we cracked open Operation for some good old fashioned fun, my four-and-a-very-important-to-include-half-year-old son had an almost crippling meltdown, and I had a revelation. Though moving every few years is part of the job we (my husband really, but we are one) signed up for, it comes with so many mixed emotions. People constantly asked, “Are you excited about moving to I—?” I would stutter something back about feeling a lot of things, with excited being the last (but not least) of them. In the leaving part of moving, there are the feelings of apprehension, stress, loss and grief. There is the physical and mental work of sorting, purging, packing, and planning/attending goodbye get togethers that is rewarded with feelings of satisfaction in an effective process (or the inverse), appreciation for all the help and value from loved ones who soak up their time with you. In the arriving part of moving, you can be met with feelings of awe and wonder at the newness of everything, curiosity and frustration as you try to figure out how things work, loneliness and isolation as you work to make new friends and find your place. There’s exhaustion as your body works through jet lag and adrenaline surges to cope with stress. Oh, and there’s also excitement. With all this talk of emotions, I should mention that I usually score pretty high on the T side of the Feeler-Thinker spectrum. That’s not to say I don’t have feelings or emotions, but I’m most comfortable operating without their overwhelming influence. So, when these huge transitions come and there are as many emotions to sort through as there are boxes of everythingweown to put away, I have a tendency to get overloaded with it all and just want to shut down. When Judson was ready to throw the Operation game out the window, I knew just how he felt. His fine motor skill of extracting a small piece of plastic from an odd shaped space with a pair of tweezers had yet to be developed. This was a brand new task for him. The game’s buzzer of failure continually reinforced his feelings of inadequacy and limited his capacity for learning. He was quickly becoming Not-A-Fan of the game. And then I realized I could kill the buzzer. He could learn the grip and motions necessary to play the game and if the tweezers touched the side, he wouldn’t be frozen by the fear of failure. After a few rounds like that, we tried it with the buzzer on and he was much more confident in his new ability and still didn’t mind when he messed up. Since we don’t get practice rounds in most of life, I want so badly to get things right the first time I do something that anything less sounds a giant buzzer in my head. Moving involves a lot of doing things (again) for the first time and a lot of not getting them right. It involves handling a lot of different shaped emotions for myself and my family and learning how to navigate them through all the different spaces. And of course, there’s plenty of touching the sides with the tweezers. Cue the buzzer. Maybe if I kill the buzzer in my head, I can allow myself to learn with more grace. Of course I’m going to mess up, this is my first time doing this. Of course I’m going to drop the ball, there are a lot of things I can’t control. Of course I’m going to get overwhelmed, this is a lot for anyone to handle. Now, I’m not advocating a life free from the consequences of bad decisions. I’m just realizing more about how I learn by watching my kids. If I can tell them, “You’re doing fine, just keep trying. Don’t get too upset about it, try to have fun. Try it a different way if that’s not working,” then I can definitely say them to myself. Hours after the near disastrous morning session, my kids ran in from the park asking if they could play Operation, Judson insisting, “It’s my favorite game!” Now that’s the sound I want to hear, not that silly buzzer! So far, November has been my favorite month of this year. Here’s what I’ve been up to. For the first weekend of the month, a good friend here invited me to go to Kuwait with her for a work conference she had. Let me back that up. I heard she was going with her husband and baby, and right at the part where she was about to ask for help with her 2-year-old, I suggested that I go with her to help with the baby instead of her husband and then he could stay here with the toddler. I’m that good of a friend. I needed to check Kuwait off my gulf states to visit list and John has been there and didn’t really want to go again. So, both husbands agreed to this deal and we booked our flights. She decided last minute not to bring the baby, so I was off-duty for two whole days. Like, totally off-duty. I didn’t have to think about anyone’s needs and wants but my own. My friends, that is a luxury I have not had in years! I slept, I binge-watched Netflix (Master of None, brilliant show), I worked out, ran along the water, read, prayed, caught up with a great friend from DC, went to see a movie (the new Bond) even wrote some. I ate what and whenever I wanted. I did not, even once, worry about what someone else was eating. It was amazing. I had a great plan to write a month’s worth of blogs in all my free time, but besides a pretty decent list of what to write about, I didn’t get very far. I suppose my tank was pretty empty and I needed all that time to get it full again. Our hotel in Kuwait had this thing with orange pillows in all their signage. This one was on the info for breakfast. It sortof reminds me of the old church saying when two young people are dancing, “Leave room for the Holy Spirit!” Or, in this case, for lots of orange pillows. Meanwhile, my children were being lovingly cared for by some great friends here, our part-time nanny and their dad, of course. Back at home, life continued to be sweet. The weather here has dropped to the 60s-80s range, chilly enough some nights to require a long-sleeved shirt. This makes my heart sing. My kids can play outside almost all day long. We are all much happier with this arrangement! I’ve been doing a homeschool preschool co-op with Ayla and our friends, where we rotate teaching and hosting 4 kids, 3 days a week. It gives us the perfect amount of structure and social activities with plenty of fun and play in the mix. This month I covered Exercise, Farm, Geometry and Thanksgiving. Here they are washing the vegetables they dug out of the sandbox while learning about Farms. 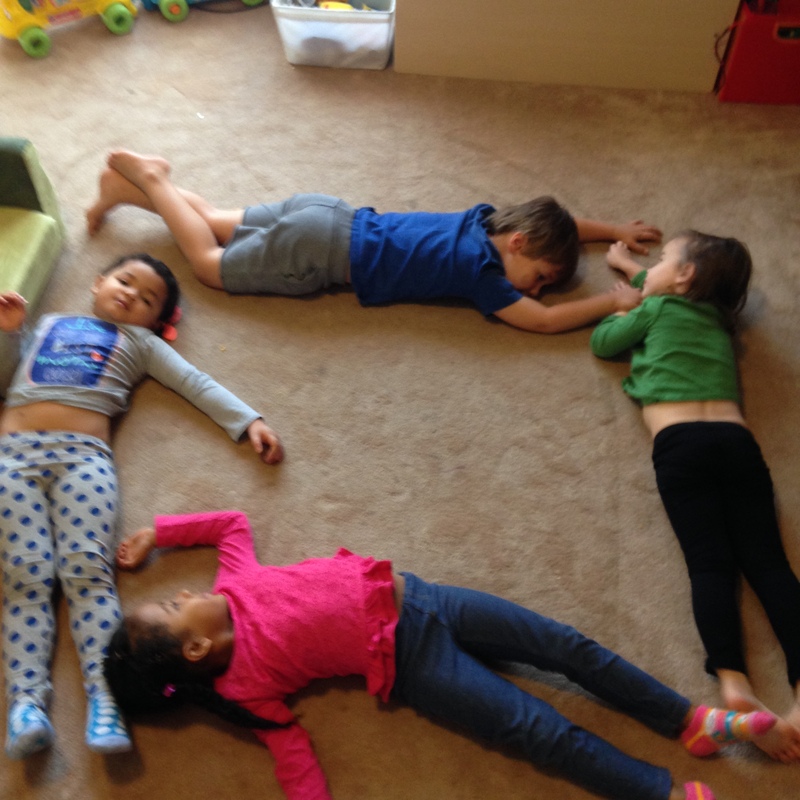 Making a square with their bodies for Geometry. Or nap time. We have lived here for almost 2 and a half years, and I’ve never met John’s local counterparts who he works with daily. Well, not until this month. We attended a desert cookout with all the families from his office and the local men they work with. It was about an hour outside of the city on beautiful sand-dunes. 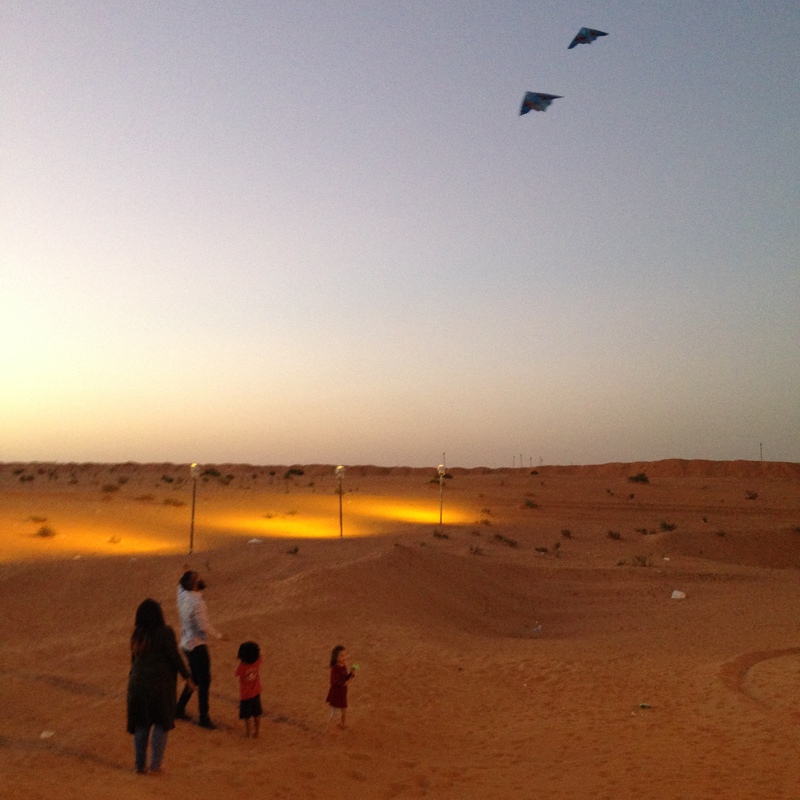 The guys passed out kites to all the kids, so when they weren’t busy climbing up and rolling down mountains of sand, we had fun with the kites. Every November, the Marine Corps celebrates its birthday around the world with the Marine Corps Ball. 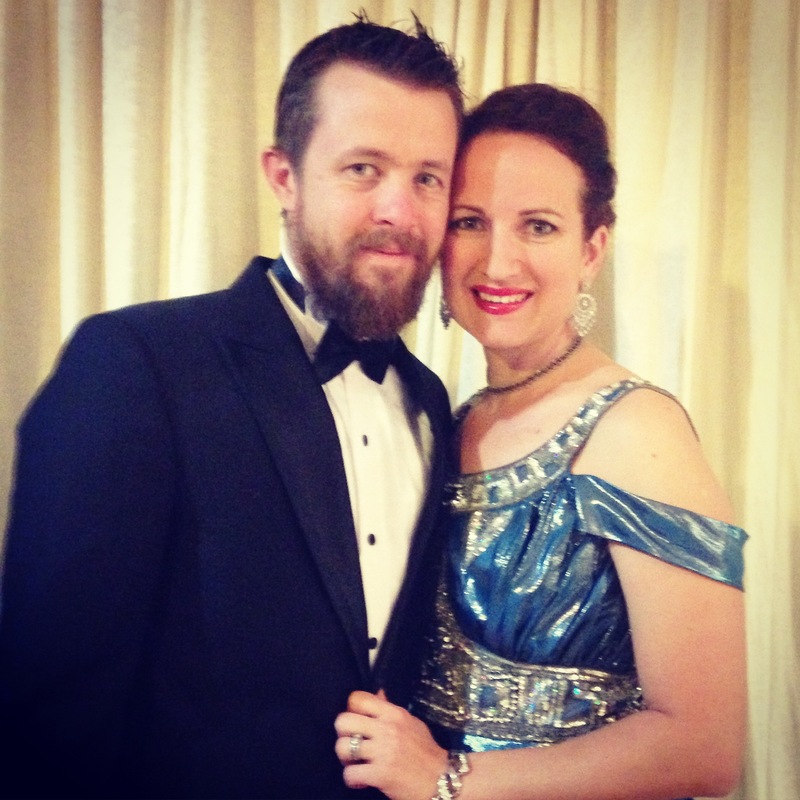 Attendees go all out with dresses, tuxedos, hair and makeup (and beards, if you’re my husband). The previous two years we went, they played the National Anthem as part of the ceremony, but only an instrumental recording of it. Some of you know that when I was in the Air Force, I had the honor to sing the Anthem at several events. This year, I offered to sing it at the Ball and they accepted. There were so many countries ambassadors and diplomats in attendance, so I really think I’ve now become an international rock-star. Maybe not, but it was fun! Just as I finished scraping the makeup off from the Ball, it was time to start getting ready for Thanksgiving. 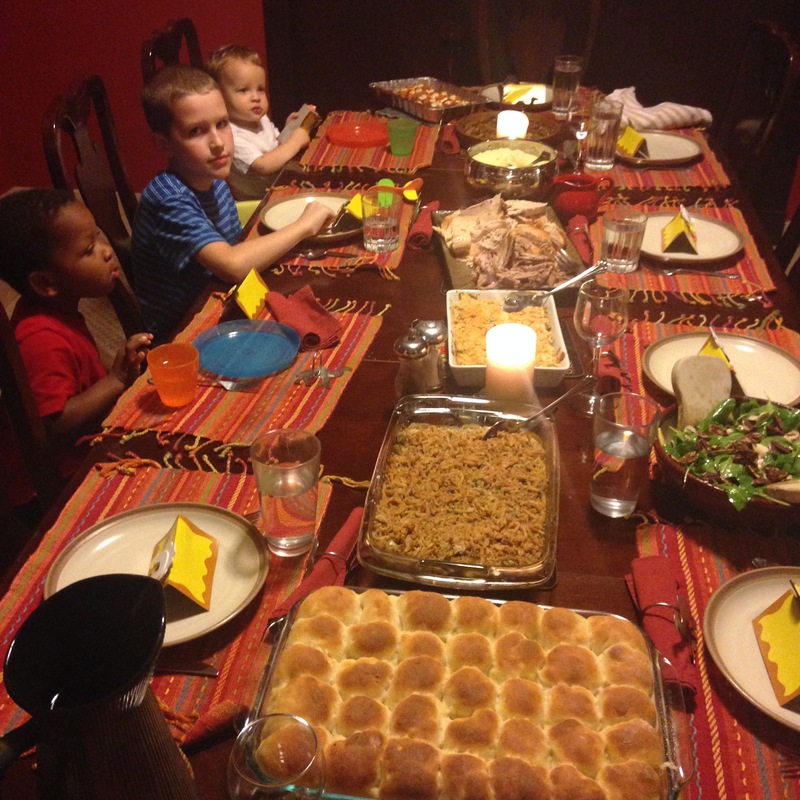 We met with a few other families from our house church and had a pretty traditional meal. I may have gone a little overboard with all the sides I signed up to bring. For me, Thanksgiving has to have certain tastes or it’s not complete, so I made sweet potatoes, green bean casserole, broccoli casserole (I have no idea why I made this, it’s not part of my tradition, just looked good! ), stuffing and for the first time ever, home made rolls. What about the pie? Oh the pie! I usually make John a pecan pie since his birthday is right around Thanksgiving, and this year I was going to do something a little healthier with a sweet potato/pecan pie mix. He caught wind of this and decided he wanted to learn how to make pecan pie. I had a bit of a dilemma, not wanting to have him make his own birthday cake and all, but wanting to encourage his budding culinary interests. 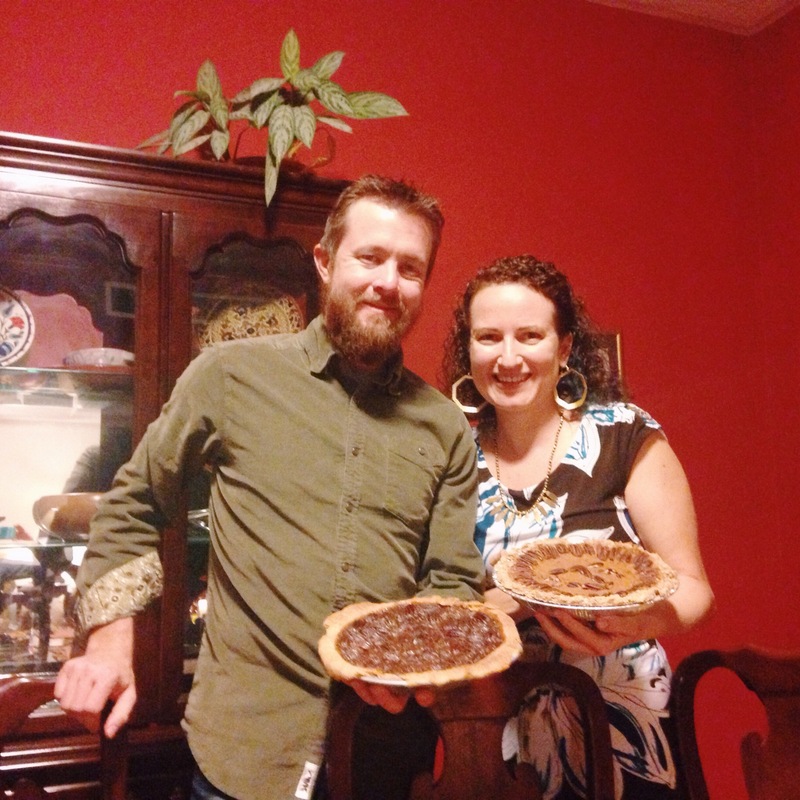 The powers that be of Facebook suggested we do a pie bake-off, so that’s what we did. We got the same number of votes, but I gave him my winning vote because he did a really good job with the crust and the pie was delicious. Mine was good, too, but it was, well, healthy and who really wants a healthy pie at Thanksgiving? 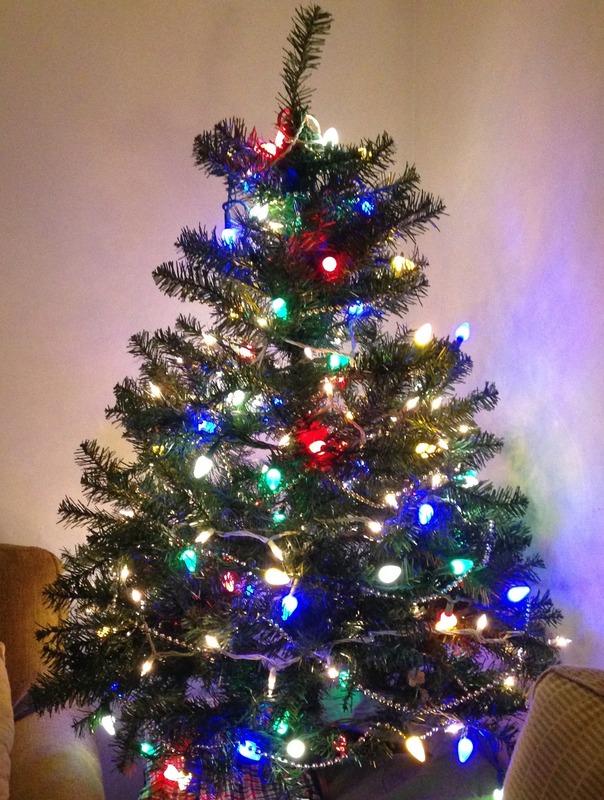 We capped off the month this very night by getting our Christmas tree up. It’s fake and only has lights and beads on it for now, but it’s up! We’ll do ornaments later with the kids and take bets on how long everything stays intact. What was the highlight of your November? The car trip from the Entebbe airport to the town of Jinja took longer than either segment of plane travel from our home in the Middle East. Our driver, appropriately named Abdullah, took as many back “roads” as he could to get around the congestion on the clogged two-lane highway. He told us the traffic that day had two main causes, heightened security due to the tragic terrorist attack in neighboring Kenya, and the holiday weekend where thousands poured out of the city to spend Easter with family in their villages. In countries like Uganda, where modern technology like cell phones and wi-fi are more prevalent in the rural areas than basic social services like a working sewage system or driveable roads, you can see this tension as traditions shift and give way to modernization and globalization. Far more tragic than a four-hour traffic jam is the toll this shift has taken on the family unit. Not too terribly long ago in tribal cultures, when biological parents couldn’t care for their children, the village absorbed them. There was still a loss, but children remained in families, retaining their heritage, language and culture. More than 85% percent of occupants in orphanages in Uganda have at least one, if not two, living birth parents. (Source here) Parents or relatives bring children to orphanages because they are out of options. Now, granted, for some the orphanage stands in place of a foster care system, providing temporary care to children whose parents are not capable of providing them with an emotionally and physically safe place to live, but still desire to be in their lives and reunited with them eventually. The Ugandan Ministry of Gender, Labour and Social Development, estimates there are more than 800 orphanages in Uganda. Jinja is home to countless orphanages (literally, many operate unregistered, so there is no way to count them). Some organizations focus on getting the children into a pipeline for foreign adoption, while others do their best to keep the children with local families. We toured one of the latter, Good Shepherd’s Fold, and were very impressed with the facilities. They had immaculate landscaping, tidy houses, clean children laughing and dancing together and sprawling property with chapels, school rooms, livestock and farming. It seemed to be a thriving, comfortable community for children to grow up in. In contrast, Abide Family Center is on a small, gated compound, surrounded on all sides by tall brick walls topped with broken glass shards to deter thieves. The centers of activity are a classroom with no walls where the staff meets daily to pray and plan the day and caregivers take parenting and business classes to help get them back on their feet. In the small, outdoor kitchen, the cook, Margaret, and her rotating roster of helpers, prepare tea, snacks and lunch for all the children, their caregivers and the staff. Two small classrooms, decorated as brightly as possible, house the Childhood Development Center, where dedicated staff care for and teach pre-school aged children and infants while their caregivers are in class. Their new sustainability venture, Stitched Together, takes up a few more rooms, where women are learning to sew, so they can support themselves and give back to Abide. In other small but clean rooms on the property, families can stay in Emergency Housing for up to three months while they’re going through Abide’s programs. The major differences between these institutions are not the size of the property or provisions available. The presence of caregivers (biological mothers, fathers, grandparents and such) with their children and the emphasis on the temporary make Abide stand out in a crowd of orphanages. Megan Parker, and the staff at Abide, don’t want the families to be too comfortable there. They should want to complete the programs and move out and up. Most of the families going through the programs are not staying on Abide’s property, so the social workers spend most of their days doing visitations with them at their businesses and homes. I tagged along with Income Generator Director, Juliet, as she went to visit two of her graduates, Justine and Anna. After going through Abide’s business class, Justine learned how to style hair and with small grant was able to open her own hair salon. She’s already training another woman and looking to open her second location. I had read about her on Abide’s blog, so I told her she was a celebrity to me. She smiled graciously and agreed to a photo (no autograph though). Anna operates a fruit and vegetable stand in an open-air market and is now able to send her children to school. Juliet does some post-graduate mentoring with Anna, at her market stand. Judson enjoying one of Anna’s bananas. These two represent the many lives Abide has changed, but the staff doesn’t stop for long to reflect on these success stories. There are too many clouds overhead with storms brewing, too many families on the brink of separation, and too much work to do to keep Abide’s doors open to help them. They know that the road to their goal, to move the orphan-prevention and family preservation agenda forward, to keep children in their families, is long and full of potholes and obstacles. But they also have such strong faith in the people of Uganda, that they can return to the beautiful roots of their tribal culture, at least in this regard, and one day make orphanages obsolete. I’ve got words to use and stories to tell about our time with Abide Family Center, but I’m taking extra special care with what I write to get it right. Meanwhile, here are a few pictures I posted on Instagram during our trip (apologies if these are a re-run for you!). We got to attend church on Resurrection Sunday. Highlight for us was worshipping Jesus in public with fellow believers from other nations. Highlight for Ayla was the orange soda she got to drink in children’s church. Wired much? Oh Ayla. You do not experience Uganda as much as Uganda experiences you. This part of Uganda is so lush and green, a welcome and needed break from the drab desert we call home. Judson learning some football skills from Alamanzan. Kids are in school while moms are in business class. Kyomukama is a new student in Abide’s @stitchedtogetheruganda shop. Here the ladies learn how to hand make items to support their families. Items will be available for sale once inventory is increased, so follow Stitched Together for the latest news! Like this necklace? So did I. Sadly, Judson already broke it. BUT, I have more styles to give away as sponsorship incentives for the families at @abidefamilycenter! Stay tuned for more info! My Foster Babies Made Me Do It! Five years ago this month, we welcomed our second baby, a boy, into our home. “Baby Z” was two weeks old. He was strong and scrumptious. Though we only had him for two weeks before the county placed him with another foster mom, his mark on our family is permanent. Something changes in you when you’re responsible for someone this fragile. I just happened to be babysitting Baby F when Baby Z was dropped off. A few months earlier, we had provided a month of respite care for “Baby F.” Even after two biological kids, I still consider her my first baby. The moment we met is crystalized for me. Forty-eight hours after her mom gave birth, her social worker brought this tiny human to my house. She set her in her car seat on my couch, handed me a small bag of clothes, a few bottles and gave instructions to feed her every three hours. That was it. The social worker left and it was just we three. Someone just brought a baby to our house and left her with us. Though we’d been pursuing and preparing for this moment for more than a year, we felt the change right there. Our hearts cracked open wide to let another part of this world have its place. We didn’t know it then, but that’s when we started preparing for our recent trip to Uganda, to visit Abide Family Center. Our experience doing foster care* included excellent training, caring and responsive social workers, and biological parents from diverse backgrounds with varying degrees of willingness to participate in family preservation with us. During the training, we latched onto the idea of fostering as a process of restoration. We would do our small part in a larger effort to keep children safe, but ultimately place them back with their biological families when at all possible. Abide Family Center social worker, Julia, holds current resident Naya, while co-founder Megan gets her daily dose of baby smiles. For the first time in, well, since ever that I can remember, my little girl, Ayla (4 going on 14), hung limp in my arms at 7:30pm, telling me she was tired. She’s usually proclaiming how not tired she is even as she rubs her eyes and yawns, fooling no one. Today, she had a very long day. First, there was pre-school co-op, then a playdate, then a birthday party at the pool, complete with pizza and home-made ice cream. She had a day filled with friends, and friends’ parents, with me as her bookends. Welcoming her into the day with a cup of milk and breakfast before rushing her out the door, then reading, singing, praying with her before we cuddled and I tucked her in bed with sweet kisses and hugs and vows of love. Shouldn’t every child get a chance to start and end their days filled and surrounded by their parents’ love? In less than 36 hours from now, we’ll be pulling our children out of bed just after midnight to get on a plane to go visit a place where two mighty women of God, Megan and Kelsey, together with their staff at Abide Family Center, are making this kind of day possible for the families in their corner of Uganda. But for the first time, they’re going to need their yellow cards to enter a country. The kids are sporting bandaids on their chubby legs from shots to keep them safe. We’re taking another break from the desert, but this is different. This time our hearts are tuned to a bigger cause. This time our purpose is lifting up other families, to bless them and cheer them on. My kids (and I) will get to play with the kids at Abide Family Center, including #hotmessMoses, that dashing fellow up there. I’ll get to meet the moms, grandmas, aunties, older brothers and daddies I’ve been adoring through their Instagram feed (@abidefamilycenter). I’ll buy up the goods the ladies of Stitched Together (@stitchedtogetheruganda) are making. I’ll get to encourage the social workers and teachers who work hard to make this a place for families to be safe and together. While my sweet little Ayla and Judson dream cozily in their beds, their mama’s dream of taking her children to see the big world God made is coming true! Will you take a minute to follow Abide on Facebook and Instagram, so you can see this good and beautiful work for yourself?